Free Shipping OR Free Webinar! Receive your customized 21-page pdf report instantly. Invite others to rate you and receive your customized 41-page pdf report. Initially, you identify your dominant level of thinking and determine how much of your thinking is in your best interest. You then discover the pros and cons of your dominant thinking style and your other thinking styles. You will also uncover your core motivation. 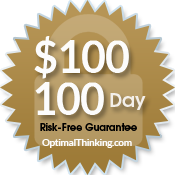 Now, become a consistent Optimal Thinker! Optimal Thinking is the vehicle that enables you to take the best actions to accomplish your most important goals. 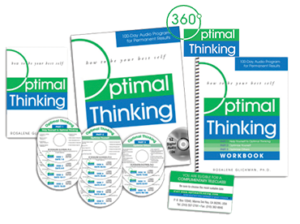 The Optimal Thinking Audio Program empowers you to make the most constructive decisions in even the toughest circumstances. You learn how to put your best self in charge and inspire others to do their best. You will diffuse your limiting core beliefs and reduce any self-sabotaging behaviors. 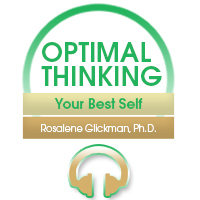 Dr. Glickman is so confident that you will develop the habit of thinking and acting optimally that she more than guarantees this program. 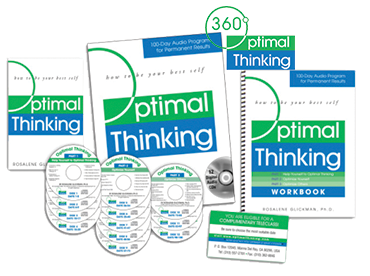 Complete the Optimal Thinking 360 Assessment & 100-Day Audio Combo and if you are dissatisfied for any reason, send in your completed 100-day workbook. We will refund your money and give you $100 cash for your effort, no questions asked. Great program. I’ve listened to it over and over. Would recommend that you make it an entirely online program. This program should be mandatory for every person in an organization because it is the basis of optimum productivity. While we all use optimal thinking here and there, this program embeds our ability to create optimal solutions as a matter of course. It’s never too late to make the most of resources and opportunities. This one of a kind program makes it happen. I’ve tried lots of personal and professional development programs. Each one has given me something but this one, really gave me everything. Once you have this program, you will have all the information to be the best you can be and make the most of your life. I purchased this program for my team and have seen a remarkable change in their engagement and productivity. They tell me it’s the most valuable program they’ve gone through in our company. This combo is the best value if you want to get into the real optimization game and stay in it. High production value on top of critically important content. My only regret is that I didn’t know about this program earlier.